Bagpipes, haggis, Celtic rock and feats of athleticism are among the highlights of the annual Scottish Festival & Highland Games. Catch a rugby match or watch the heavy athletics competition, featuring events like the caber toss (in which participants flip a 20-foot, 140-pound tree end-over-end), the 22-pound hammer throw and the sheaf toss (athletes launch a bale of hay over a high bar using a pitchfork). You can also watch Highland dance performances, men strut in kilts and the largest bagpipe band competition in the country, featuring more than 40 of the iconic instruments. Live music headliners include David Leask and the Glengarry Bhoys. Proceeds benefit the Caledonia Senior Living & Memory Care. 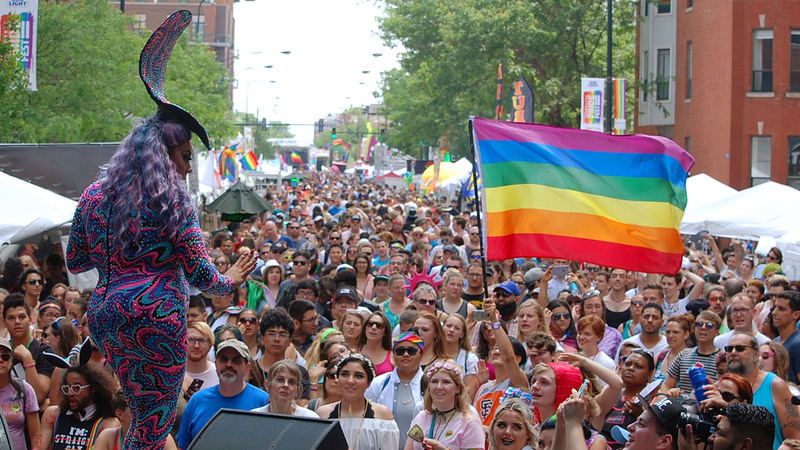 Spend the weekend celebrating diversity, equality and the city’s LGBTQ community at Chicago Pride Fest. Held the weekend before the annual Pride Parade, the two-day fest features arts and crafts vendors, DJs, dancing, drag shows and a pet parade and fashion show. Live music highlights: Jessica Sanchez and The Four C Notes (Saturday); and Mya and Belinda Carlisle (Sunday). Sample some of the best bites from Chicago’s restaurant row at the Taste of Randolph Street, including dishes from Bar Siena, bellyQ and Roister. A DJ stage and two stages of live music feature, among other bands: Mayer Hawthorne and Trevor Hall (Friday); Allen Stone and Chicano Batman (Saturday); and The Devil Makes Three and Lukas Nelson & Promise of the Real (Sunday). Revel in the passion of Spanish dance, music and culture at Ensemble Espanol’s “Flamenco Passion: A Tribute to Jose Greco’s 100th Anniversary.” More than 40 dancers perform a fusion of classical, folklore, traditional and contemporary flamenco styles. Each performance will conclude with Ensemble Espanol’s critically acclaimed “Bolero,” choreographed by founder Dame Libby Komaiko. Watch our story on the group to learn more. Commemorate the 125th anniversary of the World’s Columbian Exhibition by lending a hand at It’s Your Park Day at Midway Plaisance. Start the day by helping clean up the park before hearing from storytellers and embarking on a historical walking tour covering the history of the fair and the first Ferris Wheel on the Midway. Dance to Puerto Rican music, discover the island’s folk art and dine on Latin American and Puerto Rican dishes at the annual Fiestas Patronales Puertorriquenas. Be sure to catch the 49th Chicago Puerto Rican Day Parade (11:30 a.m. Saturday) as it reclaims its original route in the Loop, along Columbus Drive from Balbo Drive to Monroe Street. Classic cars, carnival rides and a dominoes tournament are also on tap. Partial proceeds benefit hurricane relief efforts in Puerto Rico. Music highlights: Jose Alberto (Friday), Jerry Rivera (Saturday) and Ivy Queen (Sunday). Looking for the perfect gift for dad? Bring him to a special pop-up edition of the Renegade Craft Fair in Wrigleyville, where he can check out ties, leather wallets, records and other handcrafted items. Soak up the views of Wrigley Field as you wander the booths. Immerse yourself in Italian culture (and cuisine) at Festa Pasta Vino on Oakley Avenue, where you can dine on Italian dishes, sip vino, stroll through a Florentine market and watch Venetian-costumed performers, all in the Heart of Chicago neighborhood. Go wild, beer lovers at Craft Brews at the Zoo, where more than 120 craft beers are on tap. Extras include DJ entertainment, lawn games and a chance to visit zoo animals as you imbibe. Browse the works of more than 300 local and international artists at the Gold Coast Art Fair at Grant Park. Live music, art demonstrations and interactive art projects round out the fest. Bonus: go for a spin on the “spin art” machine to create your own masterpiece of spirals and splashes of paint.